My niece just graduated college and it only took here a couple of weeks to secure her first teaching position. Of course that job is out of state and she starts at the end of July. Therefore she is in a mad dash to find her first apartment or house and get moved before then. There is not much benefit to having me as an uncle unless you find yourself in need of furniture. Well, as long as you’re not too picky and are willing to have a piece or two of quirky furniture. So given the time frame, I volunteered to build her a table. 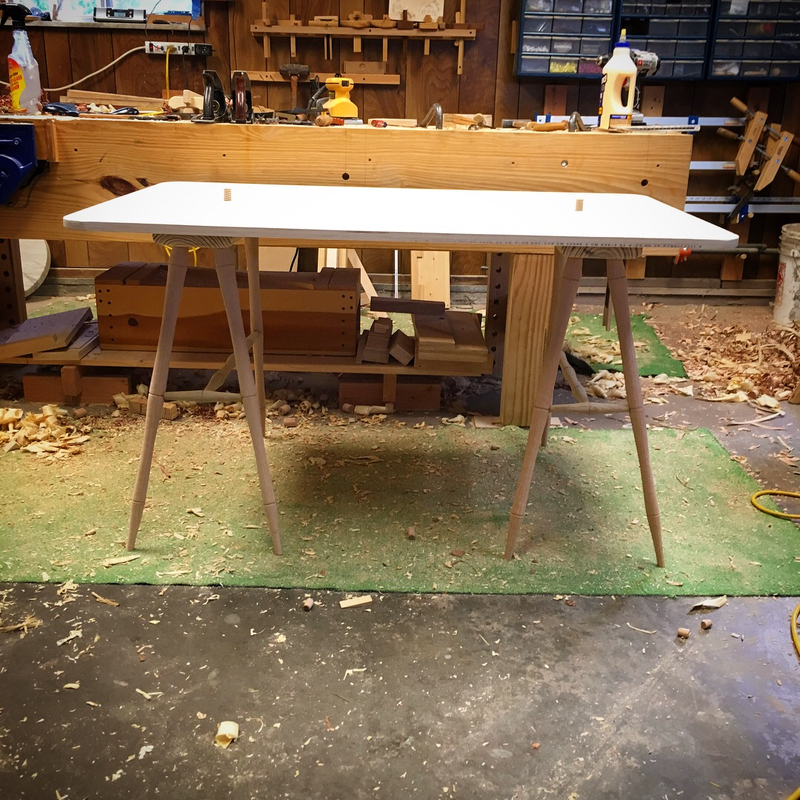 The table I designed as a sewing table for my wife should fit the bill. Not too big and breaks down for easy portability. 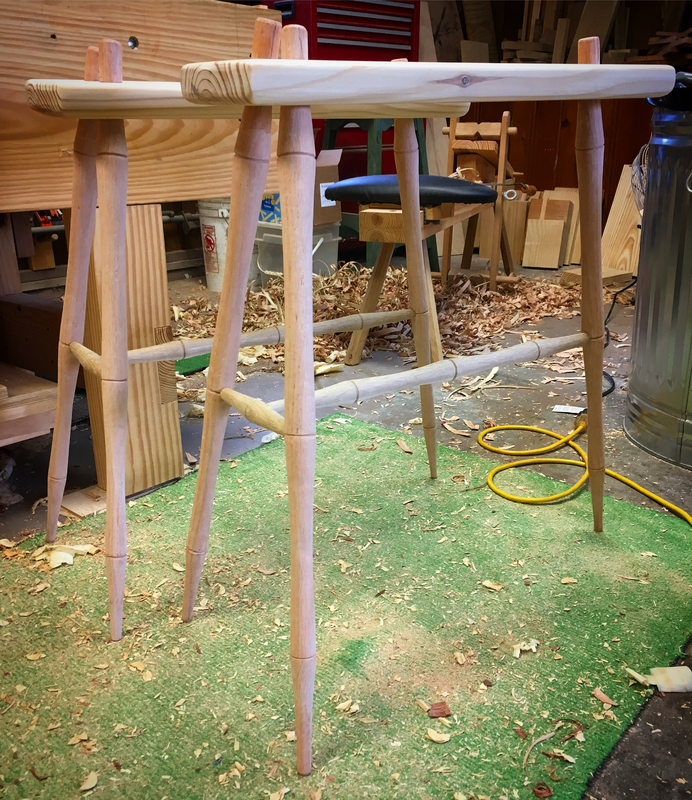 Plus, staked furniture is super quick to build. 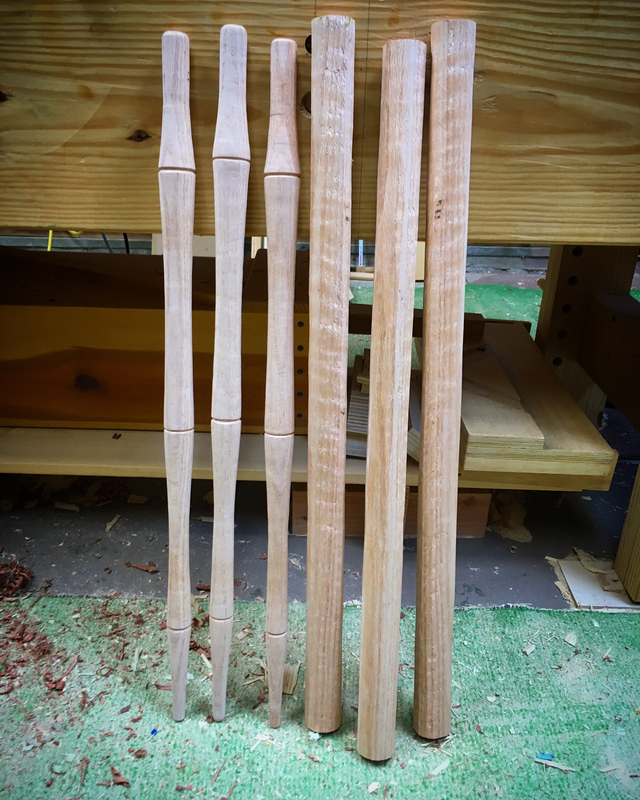 I jumped right in and milled up stock for the legs and stretchers. Then put the shave horse and spring pole lathe to work. 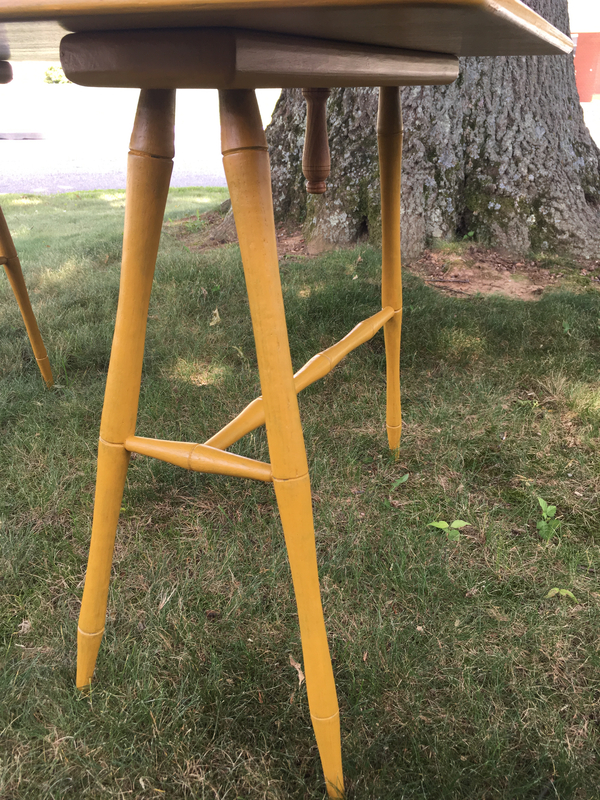 Once I had all of the legs turned, I made the tops for the trestles from SYP and installed the legs into them. 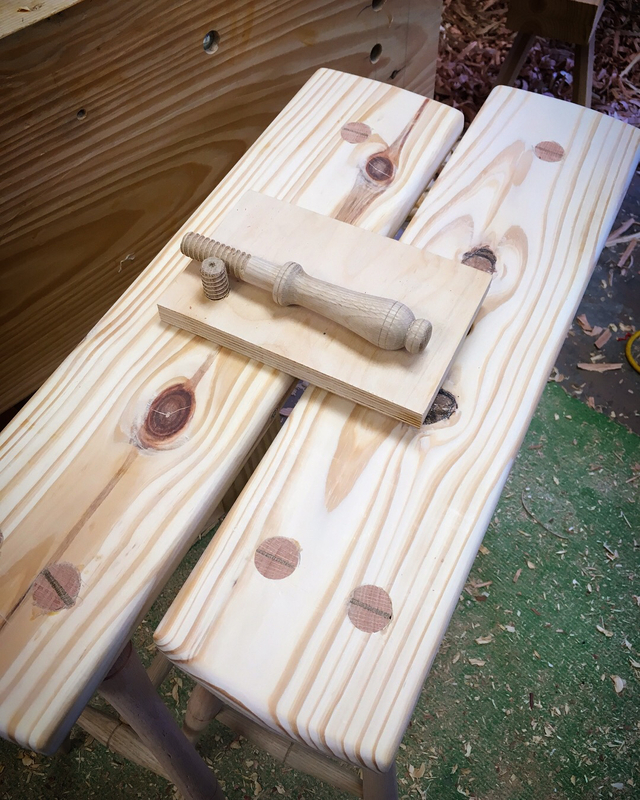 I then turned and threaded the handles that clap the top to the trestles. The top is a simple slab of birch ply with minimal shaping to the edges. I could have either oiled it and called it done or given it a simple coat of paint, but where is the fun in that? So another adventure in milk paint ensued. 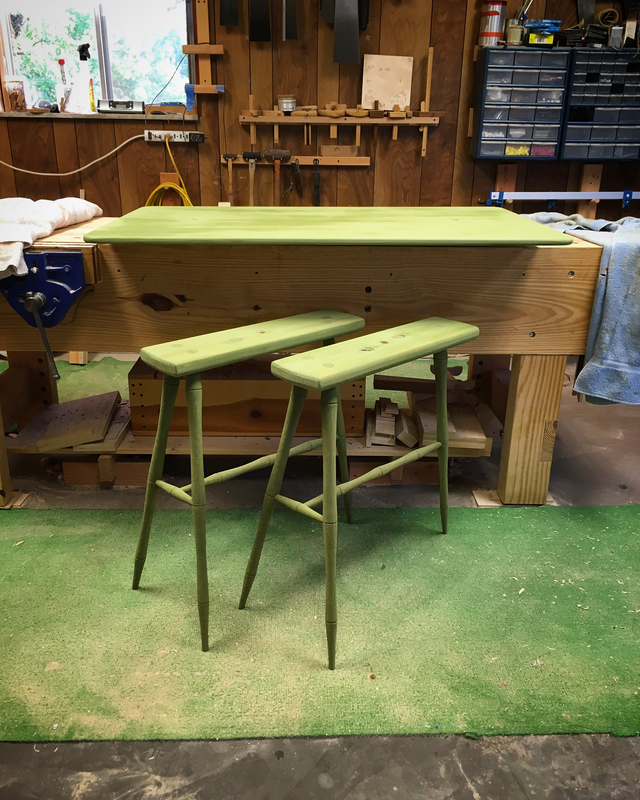 First everything received a two coats of Bayberry Green. 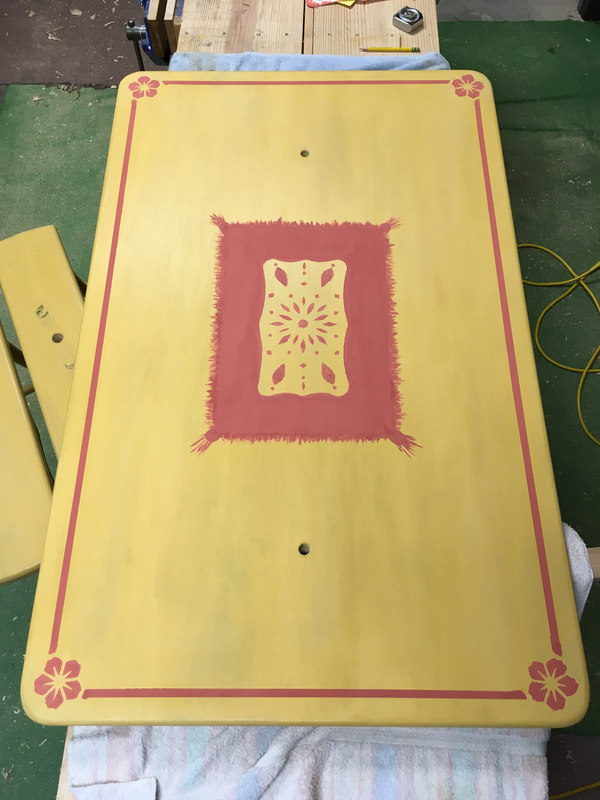 Then a coat of Marigold Yellow. Then some stenciling to add a bit of pizzazz . After letting the last coat of paint dry for twenty four hours, I rubbed everything smooth with 0000 steel wool. The steel wool burnishes the surface and cuts through the yellow coat allowing some of the green undercoat to show through. With that out of the way, it was time to start adding oil and wax. Milk paint is tricky. You never really know what the final color and effect will be until the finishing process is complete. Experience will give you a good idea, but lots of factors come into play that can subtly alter the final look of the piece. There is actually much more green showing though than my camera will pick up, but here is the completed table. My niece will take delivery of this table in the next few days and I really hope that she likes it. Hopefully she cherishes it and keeps it with her all through her life’s journey and passes it on to her children. That may be a bit of pressure to put on a simple quirky table, but time will tell. 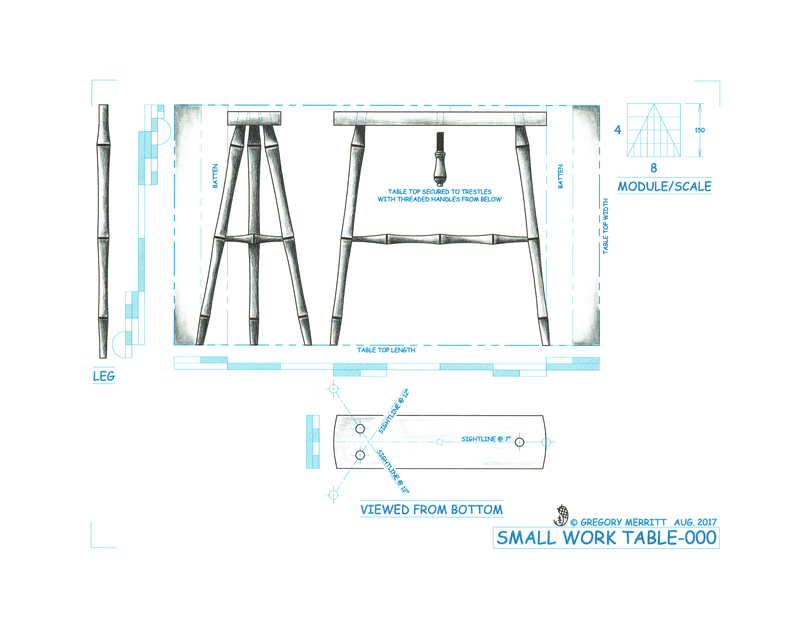 At any rate, I think I came pretty close in creating a new table that looks like it has been around 100 years. 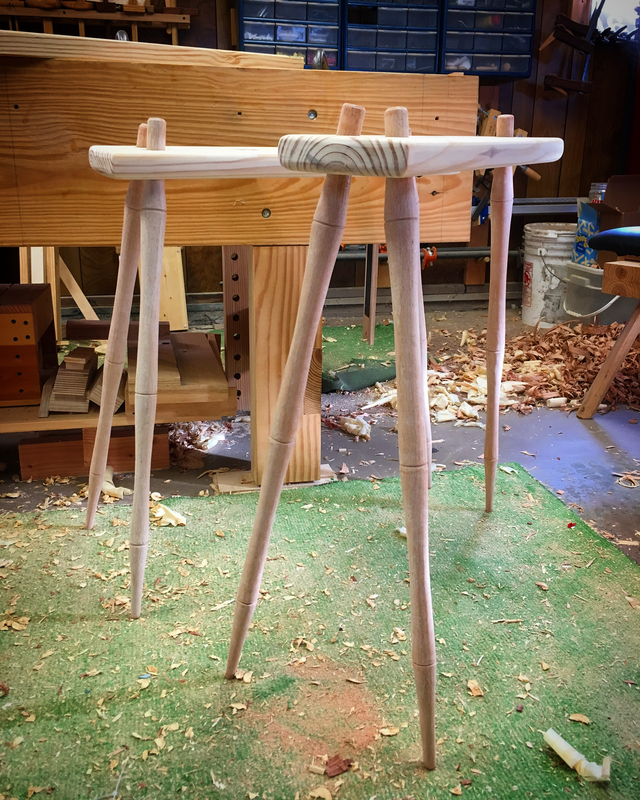 This entry was posted in Sewing Table and tagged milk paint, Spring Pole Lathe, staked furniture, Tried and True, wood threading, wood turning. Bookmark the permalink. Nicely done!! Having it break down like that will make it much easier to move and transport! I’m betting that will ever be “the table my uncle made” when she shows it off to her friends. Thanks! I hope she feels that way when she sees it. Very nice work! Beautiful design and execution. I love it. 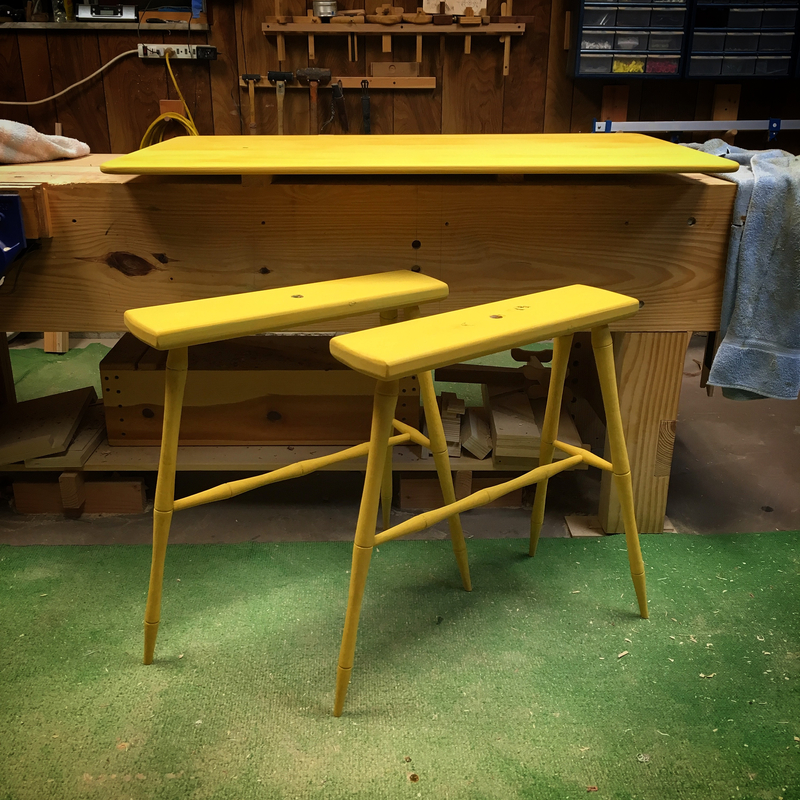 I would never have thought of painting a table yellow, but it works wonderfully. 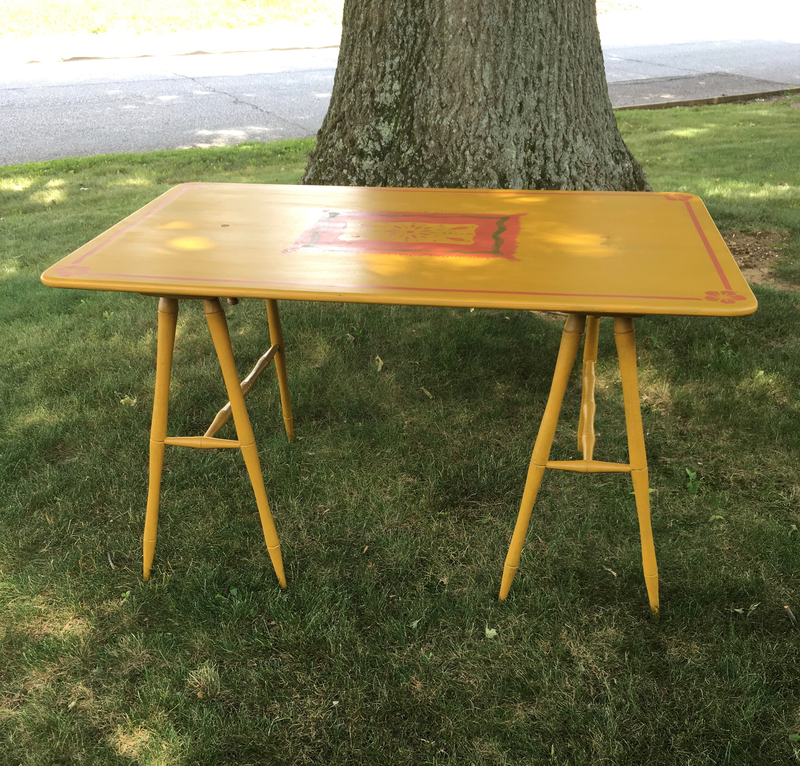 Is the red detail on the top also milk paint? Yep, all milk paint. 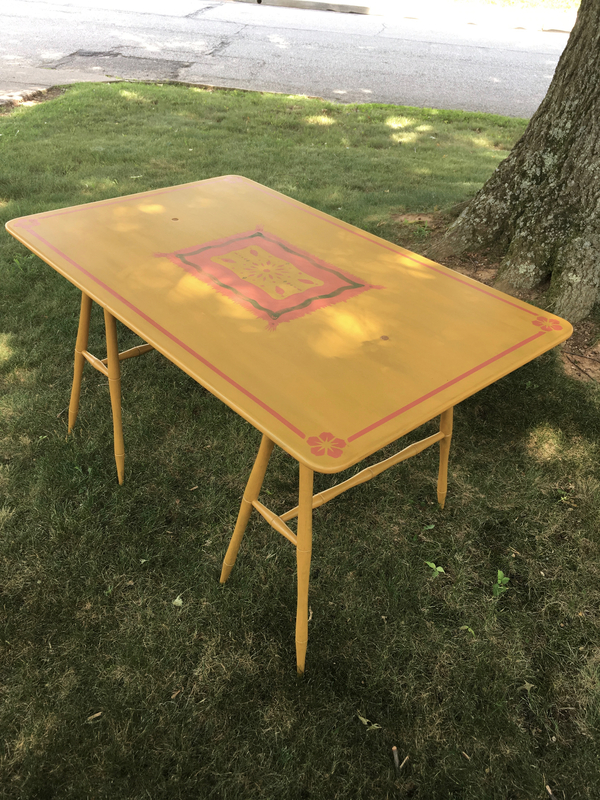 I used the exact same stencils as with the sewing table too. 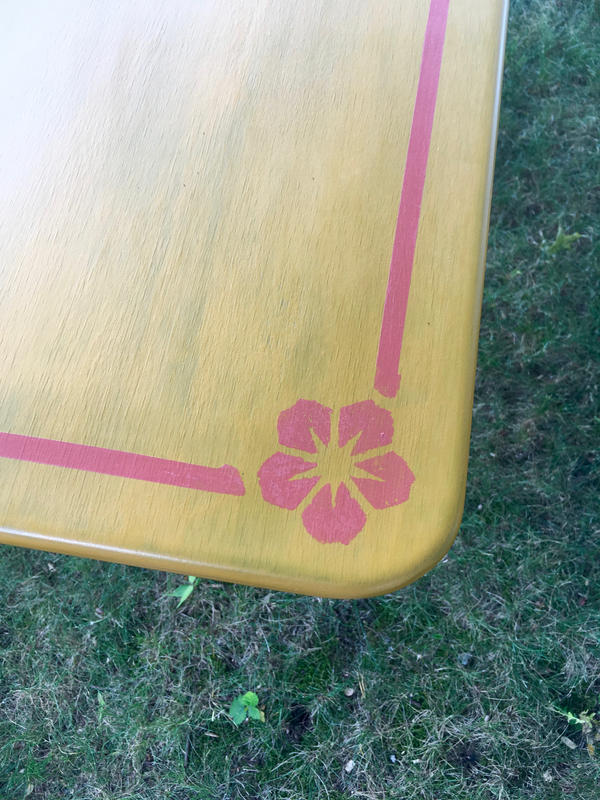 I mixed the milk paint pretty thick to use it with the stencils. It was more paste than paint. It has heart and will mean all the more for that. It looks like you’ve gotten really good at turning on your lathe. What do you think are the pros and cons of a spring pole lathe? The short answer is that I do not want for anything more. If you do a search of this blog tou will find several posts going into detail.